The SynGas Heat Module is a simpler and cheaper, more compact and more scalable system than the CHP Module. 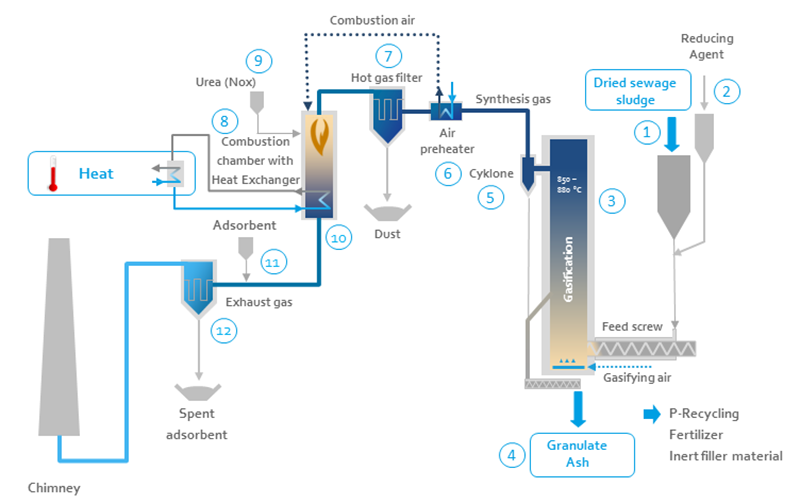 The energy contained in the sewage sludge is completely converted into heat by combusting the synthesis gas in a low-NOx burner immediately after its production. The generated heat is sufficient as the sole heat supply of the sewage sludge drying. The system sewage sludge drying and sludge utilization is thus thermally self-sufficient. From the silo, sewage sludge with a dry content of 85% – 95% (1) is conveyed together with limestone (2) into the fluidized bed gasifier (3). The added limestone binds sulphur in the first desulphurization stage. The high gasification temperature of 850 °C completely destroys all toxic substances in the sewage sludge and removes heavy metals such as mercury or cadmium from the valuable sewage sludge ash. It ensures that the vital phosphorus in the ash granulate can be made directly available for use e.g. as fertilizer. The almost carbon-free ash granulate (4) is removed from the process via a sluice and collected. 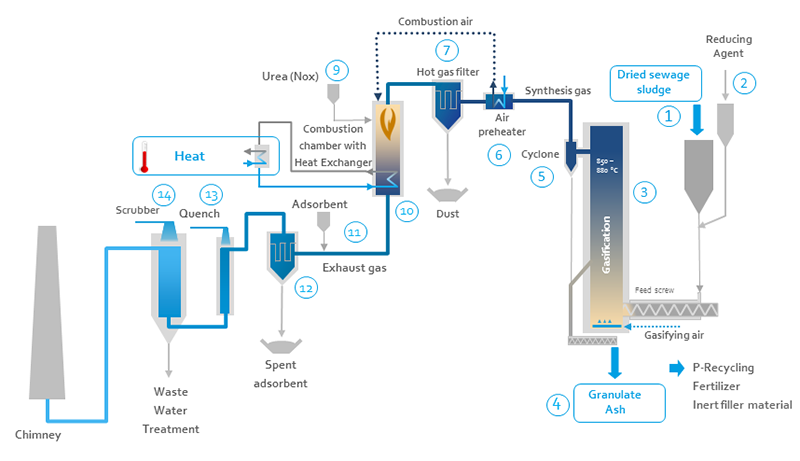 The synthesis gas produced in the fluidized bed gasifier is coarsely de-dusted in a cyclone (5) before the sensible heat of the synthesis gas is used in a heat exchanger (6) to preheat the combustion air. The cooled synthesis gas is cleaned further in a fine filter (7). The cooled and de-dusted synthesis gas is burnt in a combustion chamber (8). The heat generated during combustion recovered by means of heat exchangers (10). The amount of heat recovered is usually sufficient for drying the dewatered sludge. The combustion chamber is equipped with urea injection (9). The urea serves to reduce nitrogen oxide emissions to the limit values specified in the 17th BImSchV (17th German Federal Pollution Control Ordinance). In a compact flue gas cleaning plant, environmental pollutants originating in the sewage sludge and remaining in the flue gas after synthesis gas combustion (among others as oxidised products) are removed e.g. Sulphur oxides and heavy metals. First, an adsorbent (11) is entrained in the flue gas to incorporate heavy metals, which are subsequently removed from the process at the fine filter (12). The further treatment of the flue gas for cooling and reduction of the sulphur compounds takes place in a quencher (13) and an alkaline scrubber (14). After pre-treatment, the wastewater is discharged to the wastewater treatment plant. From the silo, sewage sludge with a dry content of 85% – 95% (1) is conveyed together with limestone (2) into the fluidized bed gasifier (3). The added limestone binds sulphur in the first desulphurization stage. The high gasification temperature of 850 °C completely destroys all toxic substances in the sewage sludge and removes heavy metals such as mercury or cadmium from the valuable sewage sludge ash. It ensures that the vital phosphorus in the ash can be made directly available for use e.g. as fertilizer. The almost carbon-free ash granulate (4) is removed from the process via a sluice and collected. The combustion chamber is equipped with urea injection (9). The urea serves to reduce nitrogen oxide emissions to the limit values specified in the 17th BImSchV (17th German Federal Pollution Control Ordinance). In a compact flue gas cleaning plant, environmental pollutants originating in the sewage sludge and remaining in the flue gas after synthesis gas combustion (among others as oxidised products) are removed. An adsorbent (11) is entrained in the flue gas to incorporate heavy metals and Sulphur oxides, which are removed from the process at the fine filter (12).